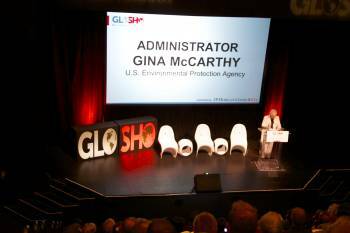 Hundreds of entrepreneurs gathered for the first day of the L.A. Cleantech Global Showcase Monday morning at the Los Angeles Theatre Center downtown, in discussion of how the city could better serve as a national hub for environmental technology. “We’ve got a huge challenge before us,” Tomo Soto, managing partner of TCW/Craton, a private equity firm, told the crowd. Participants had just run through an investment workshop and a presentation on access to water and energy markets of California. “It takes really, really hard work, which actually brings life to all of these clean technology businesses that all of you are working to generate and get out into the market,” said McCarthy, who has worked for more than 30 years on critical environmental issues at the federal, state and local levels. 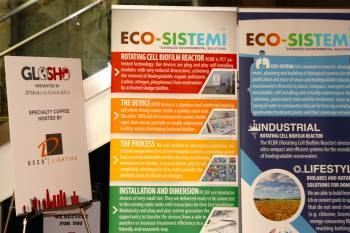 Some of the participating companies include 360 PowerGroup, Axiom Energy and VENA. 360 PowerGroup has invented and patented designs for electric generators that reduce operating fuel costs, Axiom offers the lowest-cost form of energy storage for supermarkets and VENA is developing a zero energy water harvesting technology. Among those there to attract business was Allison Kalenga, from the Economic Development Group at the Department of Water & Power. “We do that kind of by reaching out to a lot of the businesses and showing them the many programs that DWP has to offer, like incentives to get people to do business here through water rebate, energy efficiency, grants and loan programs,” she said. 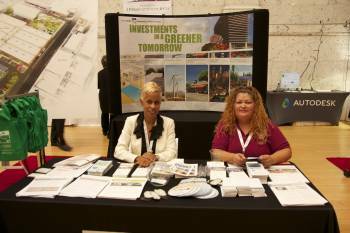 Distributing brochures beside Kalenga was Martha Rodriguez, also representing the Department of Water & Power. Consumers could also enjoy rebates on the conservation of water, she said.